Arcturian Ascension Tools: Great Balls Of Fire!!! INCOMING CME: Sunspot AR2443 erupted yesterday, producing a CME that could deliver a glancing blow to Earth's magnetic field on Nov. 7th. G1-class geomagnetic storms and high-latitude auroras are possible when the CME arrives this weekend. Visit http://spaceweather.com for more information. 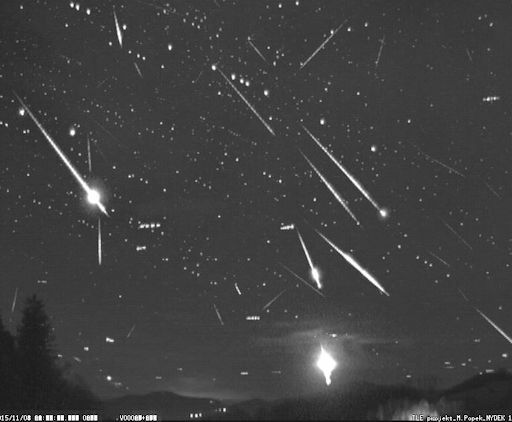 TAURID FIREBALLS: The annual Taurid meteor shower is underway--and it is unusually good. Observers around the world are reporting bright fireballs in the night sky as Earth plows through a swarm of gravelly debris from parent Comet Encke. Forecasters say the display could continue until Nov. 10th. Above: A flurry of Taurid fireballs over the Czech republic on Nov. 4th. Photo credit: Martin Popek.